Le Tramway T7 – ça roule! 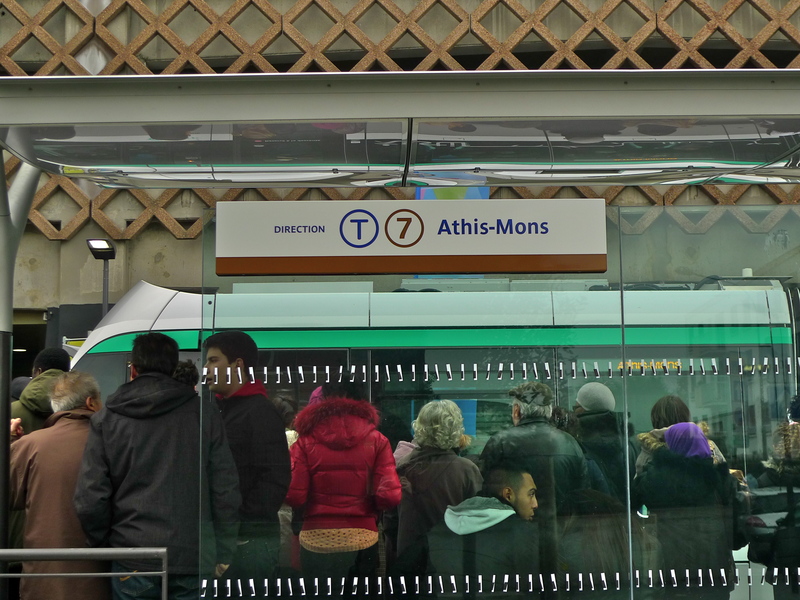 AFTER THIRTEEN YEARS OF PLANNING, four years of construction and a total expenditure of some 360 million Euros the new Paris Tramway T7 opened for business on Saturday 16th November. 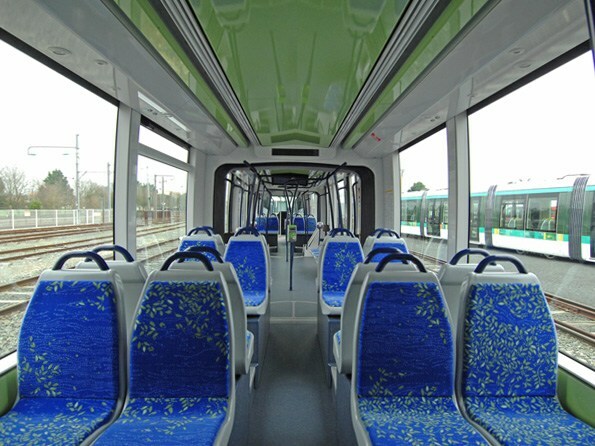 Designed to extend the public transport system between the departments of Val-de-Marne and Essonne, Tramway T7 runs from the Métro station Villejuif – Louis Aragon in the commune of Villejuif in the southern suburbs of Paris to Porte de l’Essonne in the commune of Athis-Mons close to Orly international airport. 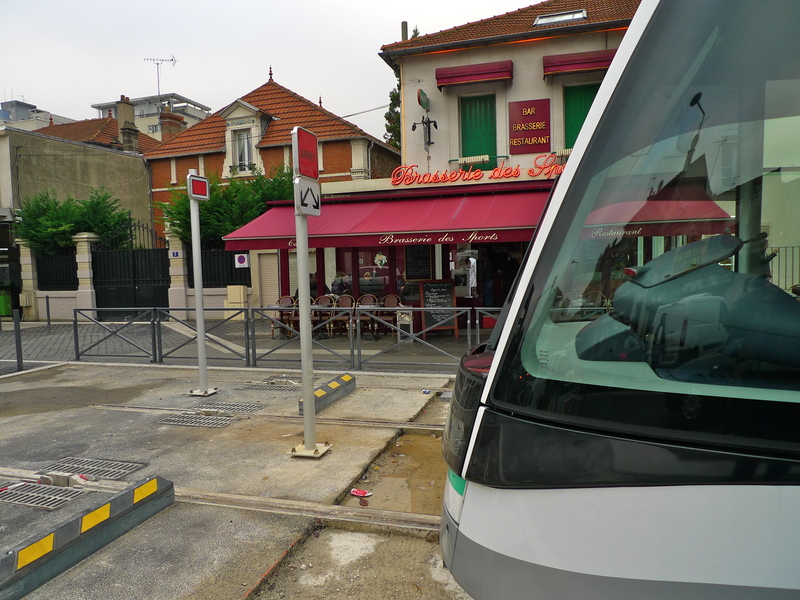 In the middle of last week I went to Villejuif to watch and record the final testing of the trams before they entered service. 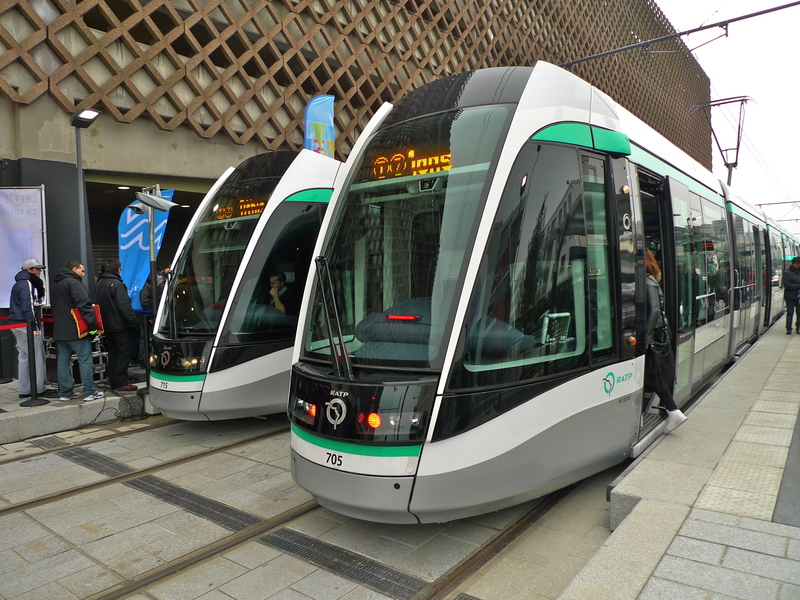 This testing began in May this year but for the last month the trams and the crews have been operating a full service without passengers – a month-long dress rehearsal to ensure that the trams entered revenue service seamlessly. 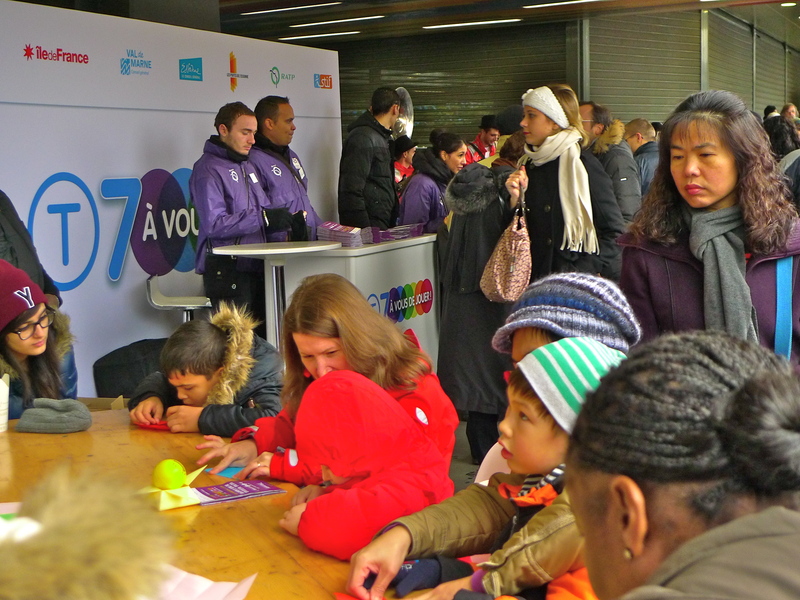 On Saturday the scene at Villejuif was very different as I and many hundreds of others arrived for the inauguration of Tramway T7. 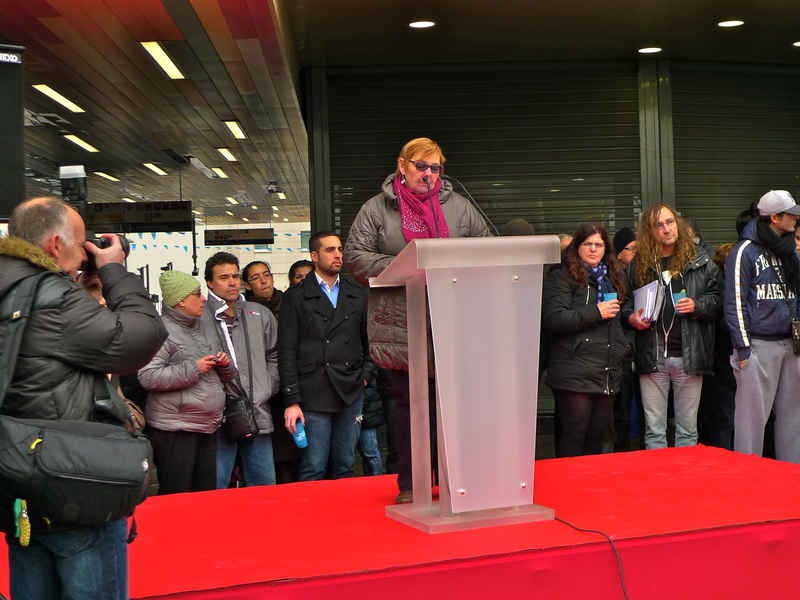 And Claudine Cordillot, Mayor of Villejuif made a speech. 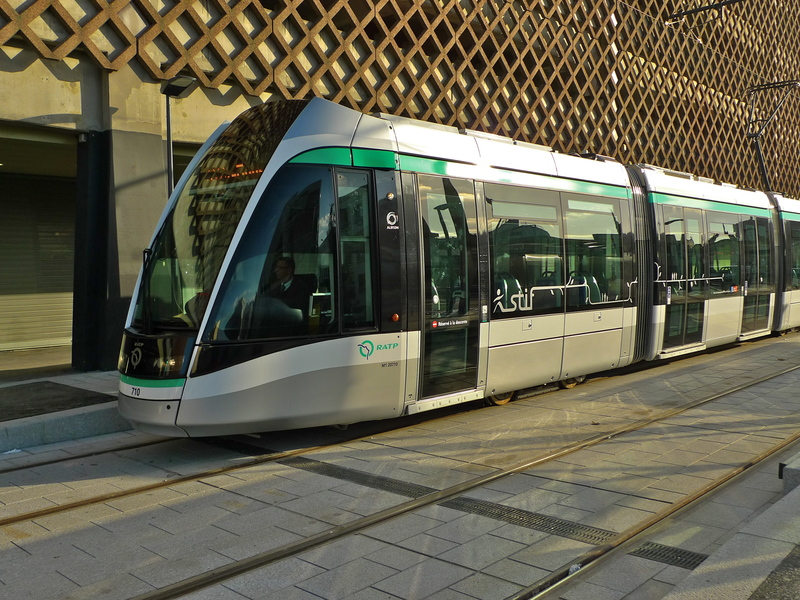 The planning for this new tramway began as far back as the year 2000 when a process of consultation with the local communities began and then, in 2002, the Syndicat des transports d’Île-de-France (STIF) gave their approval in principle for the project. 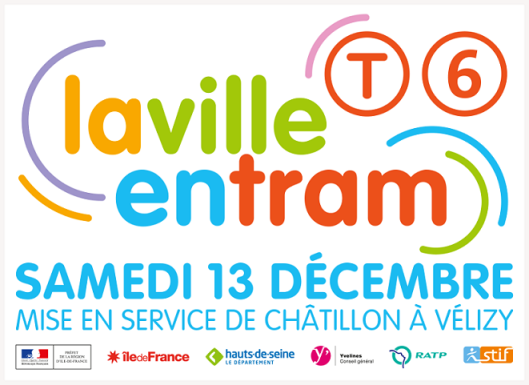 STIF is the organisation that controls the Paris public transport system and coordinates all the different transport companies operating in Île-de-France including RATP and SNCF. A public inquiry was held at the end of 2003 and the beginning of 2004 to inform the local communities of the proposed plans and to hear any concerns or objections they had. The proposed project was approved in December 2006 by RATP, STIF and the Conseil général du Val-de-Marne, the key local authority involved. In 2008, an amended proposal addressing some cost and technical issues was brought forward and this was approved in October of that year. This approval left the way clear for the preliminary construction work to begin in 2009. In parallel with the construction of the tramway work was also begun on the redevelopment of the adjacent RD7, formerly Route National 7, the trunk road that runs from Paris to Italy. €48 million for the new rolling stock. 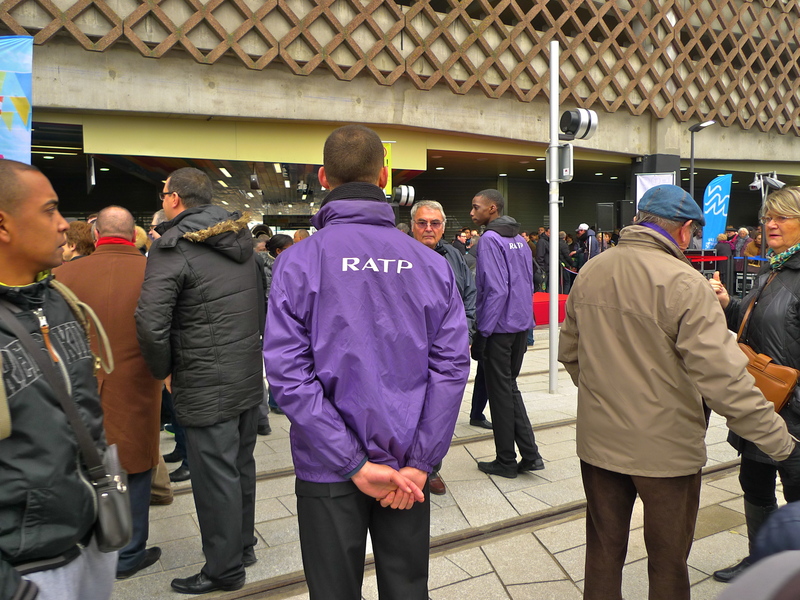 RATP (€5 million) – they operate of the tramway. STIF – who controlled whole project. 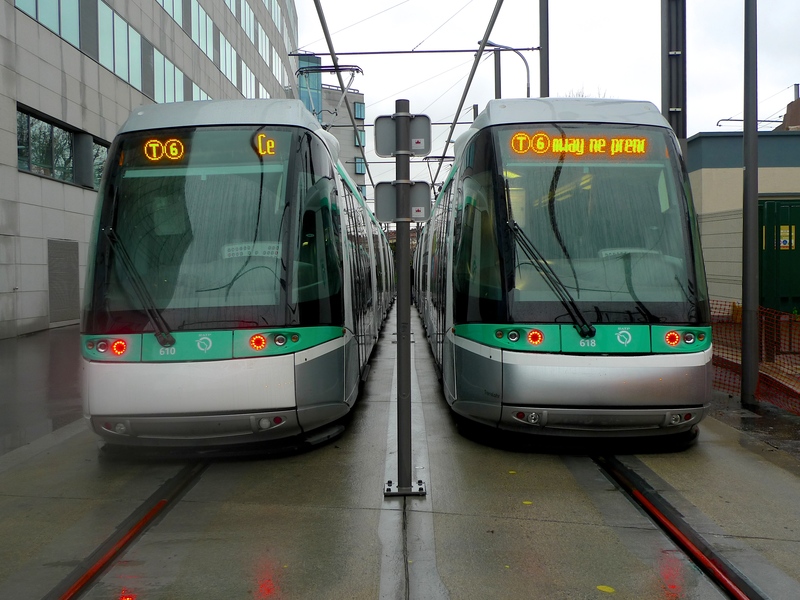 The €48 million cost of the rolling stock is funded by STIF in a RATP / STIF leasing agreement. 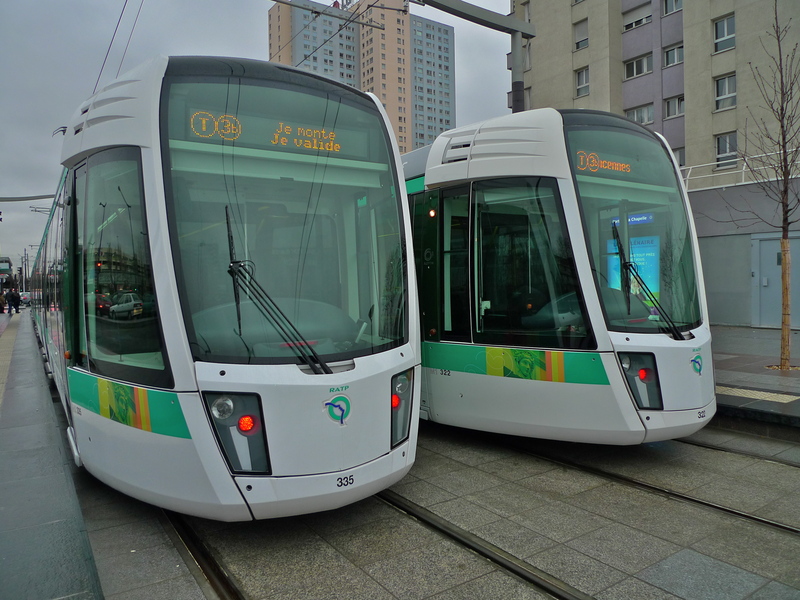 Tramway T7 runs for 11.2 km from the Métro station Villejuif – Louis Aragon to Athis-Mons – Porte de l’Essonne. There are 19 trams operating the route which means that the average waiting time at any of the 18 stations is just 5 to 6 minutes on a weekday and a little longer at weekends and public holidays. The average travel time for the whole route is 31 minutes. The tramway can handle 30,000 passengers a day. 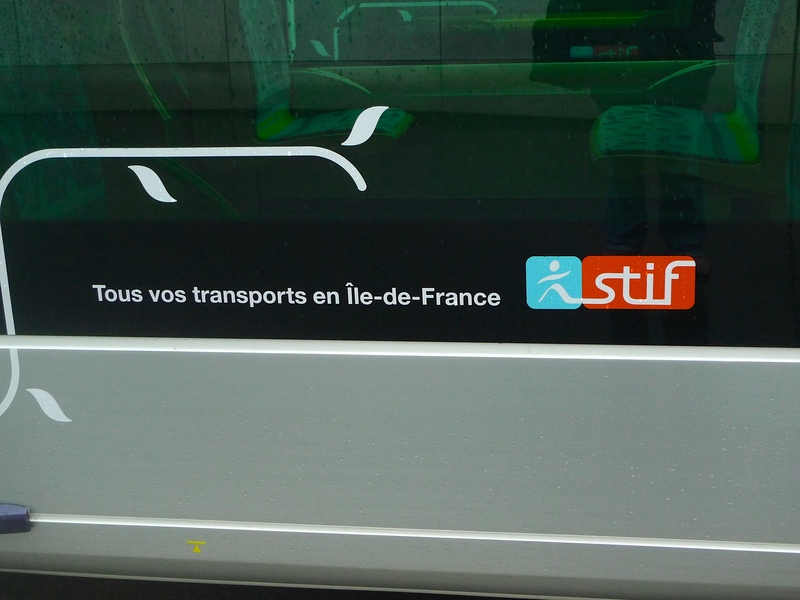 In yet another example of the joined-up thinking used by STIF and RATP, all but two of the 18 stations on this tramway have connections, or correspondances in French, with one or more bus routes. 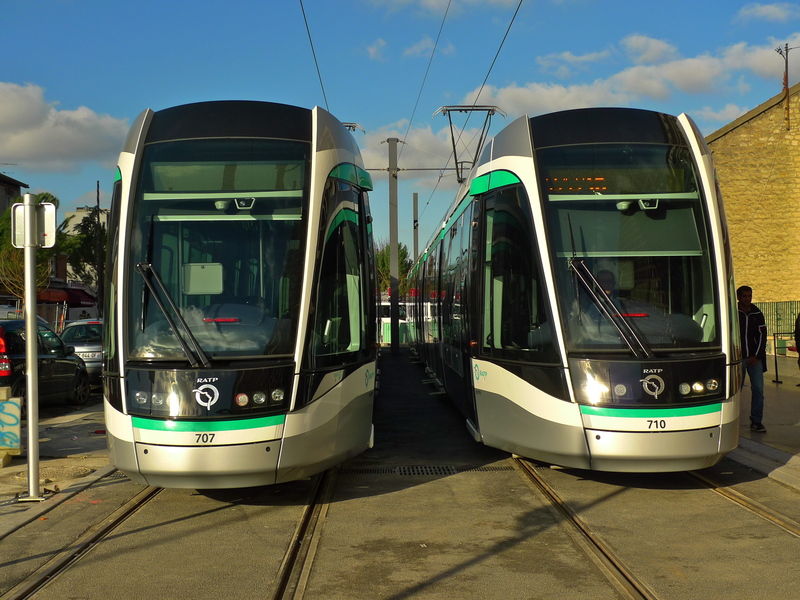 The trams used on Tramway T7 are the Citadis 302 trams built by the French company Alstom. 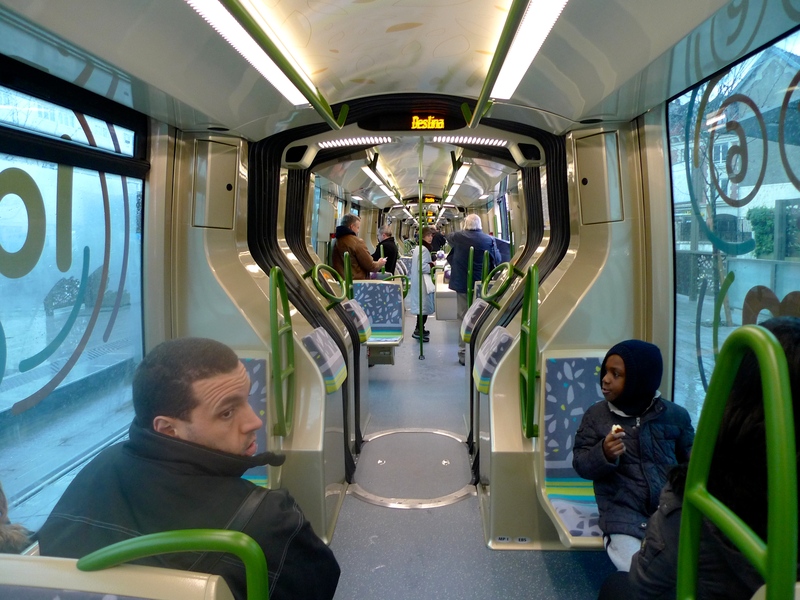 These trams are not only energy and noise efficient but their low-floor design gives easy access to wheelchairs, pushchairs and people with reduced mobility. Capable of a maximum speed of around 70 km/h the trams on tramway T7 run at an average speed somewhere around 20 km/h. Inside the trams great attention has been given to both the signage and to the announcements. The signage in the roof tells passengers at each terminus precisely when the tram is due to depart. Throughout the journey the signage displays the name of the current stop and the connections that can be made there, the name of the next stop and the time it will take to get there as well as the time it will take to get to the next terminus. Song Phanakem, the man behind the voices on the Paris mass transit system, has produced exceptionally good announcements for Tramway T7. He has used human voices of course and each tram stop announcement appears twice each time with a different intonation. The announcements are very clear and played at exactly the right volume – not too loud and not too soft. Only occasionally, in a very crowed tram with passenger’s voices raised more than usual, are the announcements a little hard to hear but the quality is such that even then they are not subsumed altogether. An interesting new feature is that at every tram stop there is an announcement to inform new passengers of the direction in which the tram is travelling. 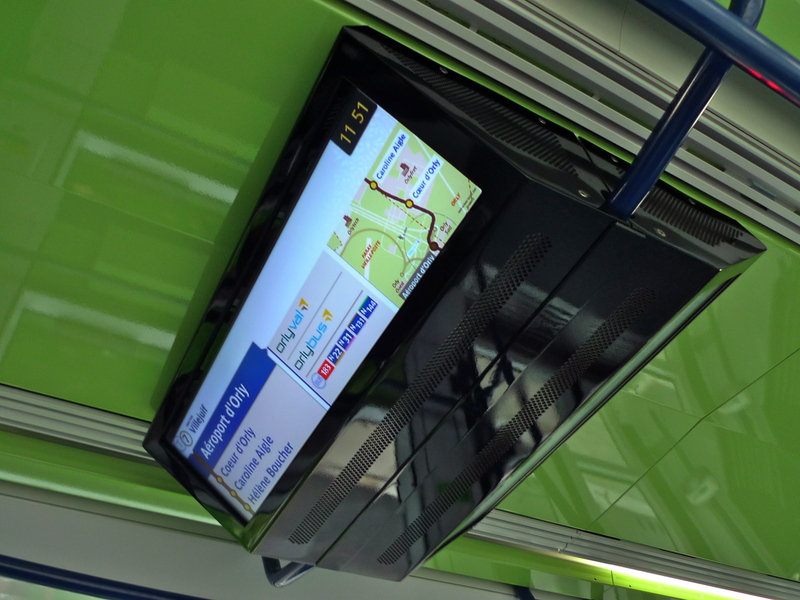 I can see this being very useful especially for international visitors travelling to or from Orly international airport who may be unfamiliar with this tram system. 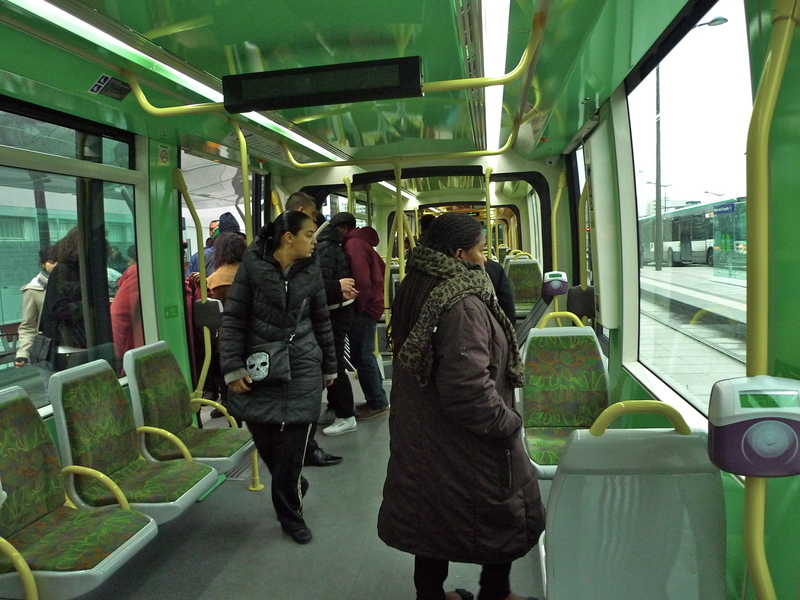 Of course, I couldn’t possibly go to the inauguration of Tramway T7 and not ride on a tram especially since for the weekend of the 16th/17th November it was completely free! 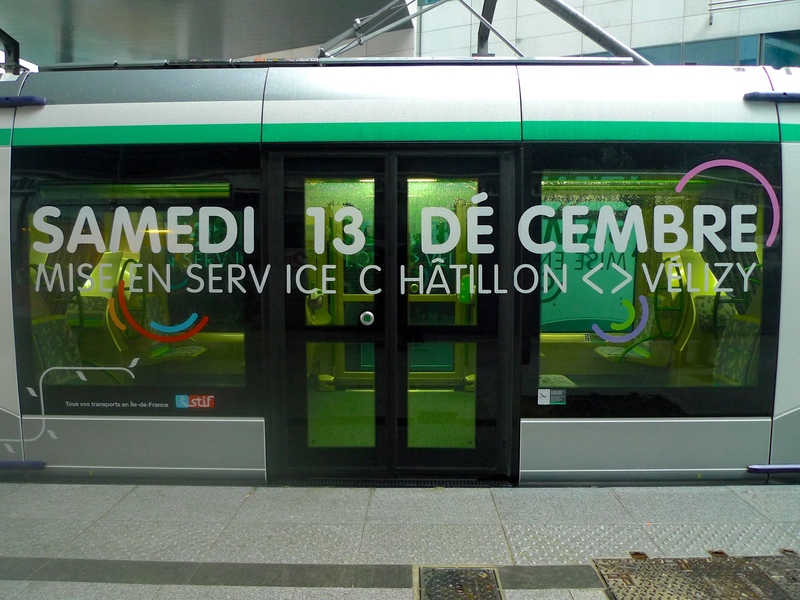 And I was very lucky because not only did I ride on a brand new tram, it was a very special new tram – the 1,500th Alstom Citadis tram in worldwide circulation. I travelled all the way from Villejuif – Louis Aragon to Athis-Mons – Porte de l’Essonne – and back again. And, of course, I couldn’t make those journeys without recording them for my Paris Soundscapes Archive. For those of you who have the time to listen, here are the sounds I captured on the outward journey. 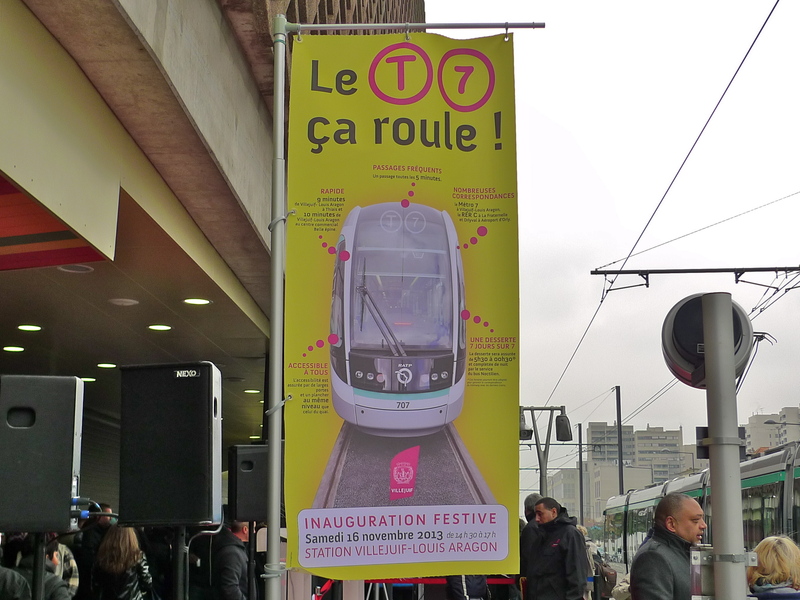 While the creation and opening of Tramway T7 is impressive the story is not over. 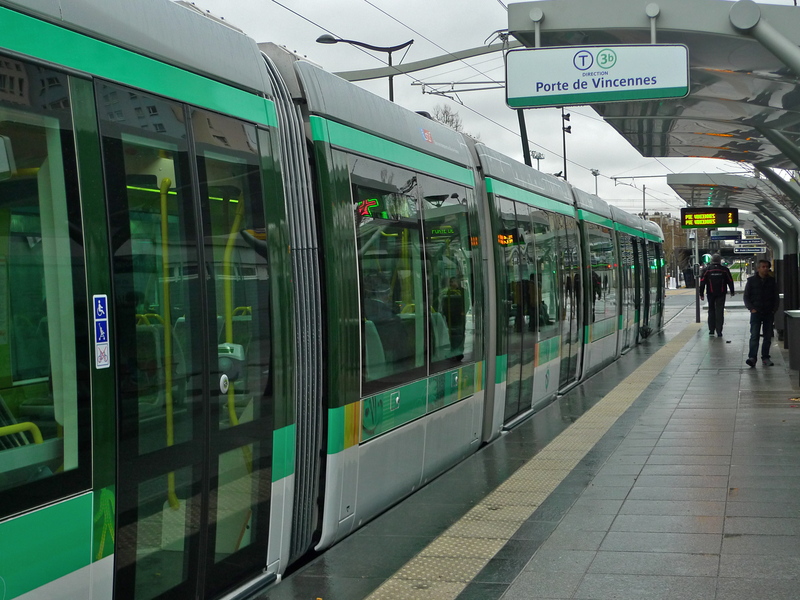 By 2018 it is planned that the tramway will be extended to Juvisy-sur-Orge and looking even further into the future, by 2020 it should connect to the new planned Métro line 15 at Villejuif- Louis Aragon. 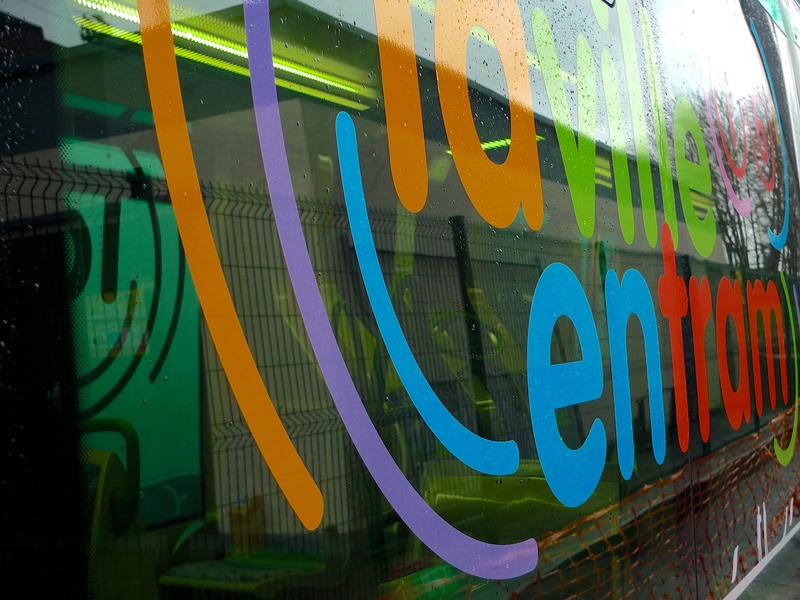 I think this is all good news especially since STIF and RATP seem to manage these new developments largely in harmony with the neighbouring local communities and in sympathy with environmental concerns. And if you think that a tramway can’t have a life of its own, Tramway T7 has its own blog! 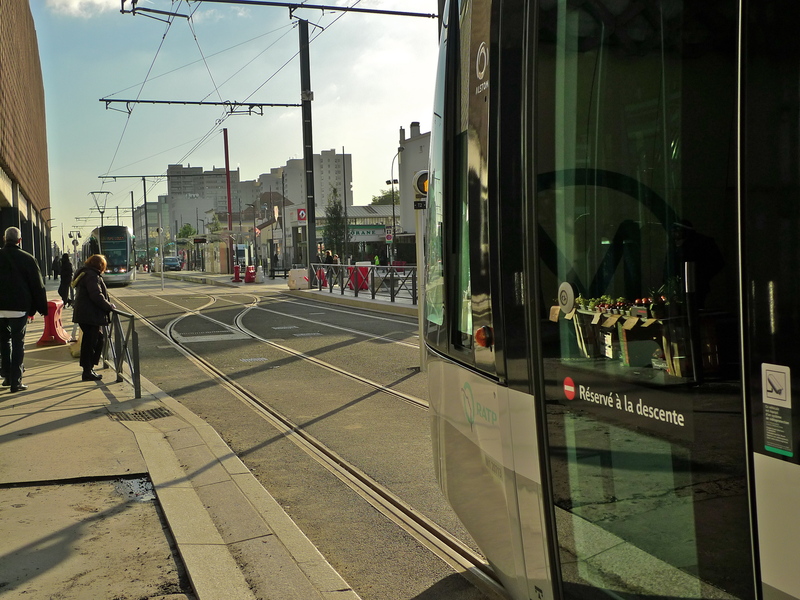 PARIS TRAM LINE 3, the orbital tram route or, the tramway des Maréchaux, has been extended and is open for business. Tram Line 3 follows the site of the old military road that ran along the inside of the fortified Thiers Wall, the last defensive wall surrounding Paris built around 1840. The wall was demolished in the 1920s, enabling the building of a series of boulevards encircling the city each named after Marshals of Napoleon’s French Empire, and consequently called the Boulevards des Maréchaux. These boulevards run just inside the city limits with the Boulevard Périphérique, the wall of traffic that surrounds Paris, running just beyond them on the site of the former Thiers Wall itself. 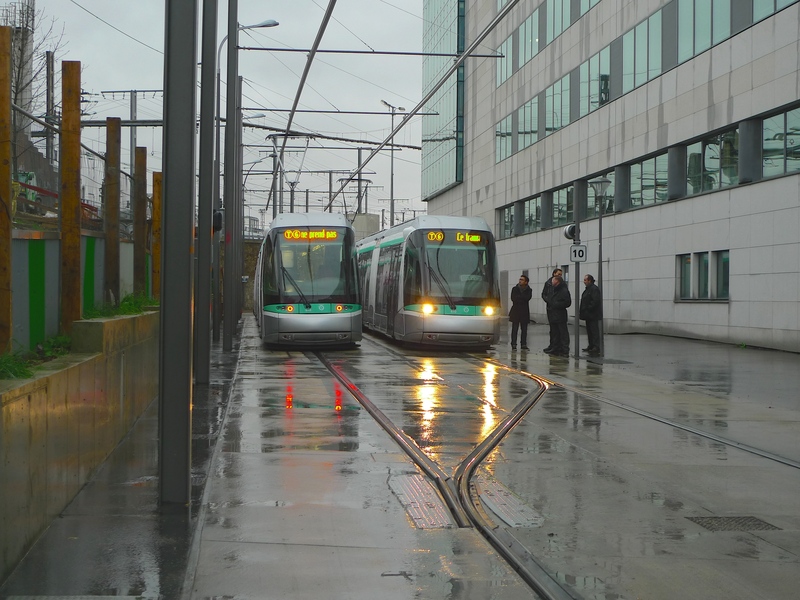 Tram Line 3 has been running along part of this route, from Pont du Garigliano to Porte d’Ivry, since December 2006. Work began on extending the route in 2009, adding 14.3km of track and 24 new tram stops, and the extended line was opened on 15th December 2012. The extended route heads northeast from Porte d’Ivry, crosses the Seine to an interchange with Métro Line 1 at Porte de Vincennes. It continues north through the Lilas district where it connects with metro lines 3bis, 11 and 7bis, then curves westwards to terminate at Porte de la Chapelle, where it connects with Métro Line 12. 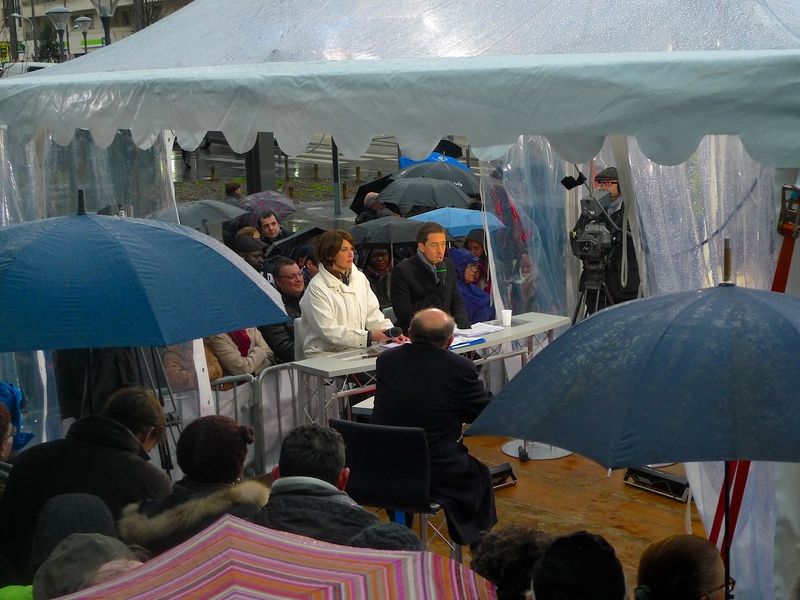 The cost is said to be €651·9m, of which €433·6m has been funded by the city and €218·3m by Ile-de-France. 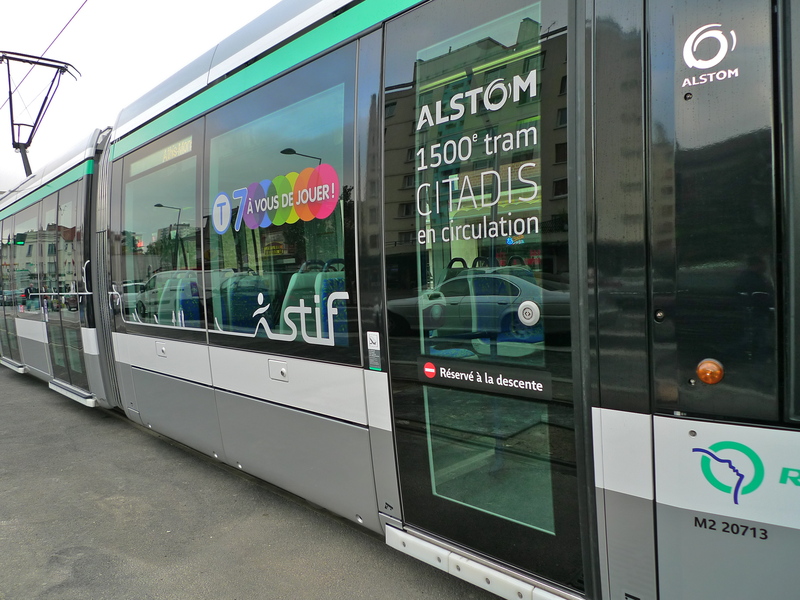 The city has contributed a further €149m for urban enhancements, whilst RATP has funded the 25 additional Citadis 402 trams at a cost of €77m. 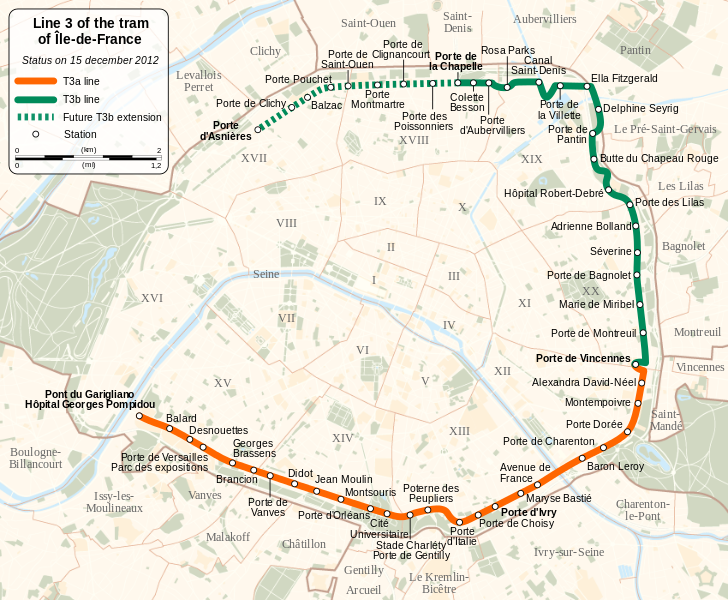 When the line extension was opened, Tram Line T3 was divided into two separate services, the existing route becoming Line T3a, linking Pont du Garigliano with Porte de Vincennes, while Line T3b covers the eastern and north eastern section from Porte de Vincennes to Porte de la Chapelle. 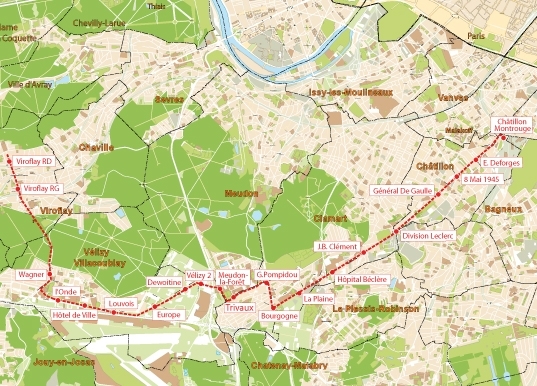 The Paris City Council has also now given approval for a further 4.7 km extension of T3 from Porte de la Chapelle to Porte d’Asnières expected to open in 2017. It is envisaged that a further extension from Porte d’Asnières to Porte Maillot is possible but, as yet, there is no talk of an extension from Porte Maillot to Pont du Garigliano to complete the circle around Paris. Shortly after the new extension opened I went to have a look. 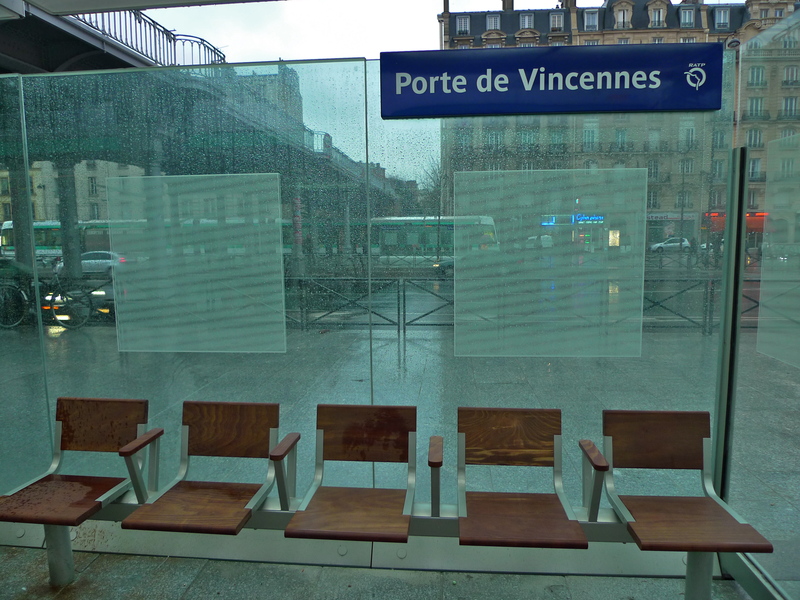 I travelled from the very smart tram stop at Porte de Vincennes to the end of the current extension, Porte de la Chapelle and I was very impressed. 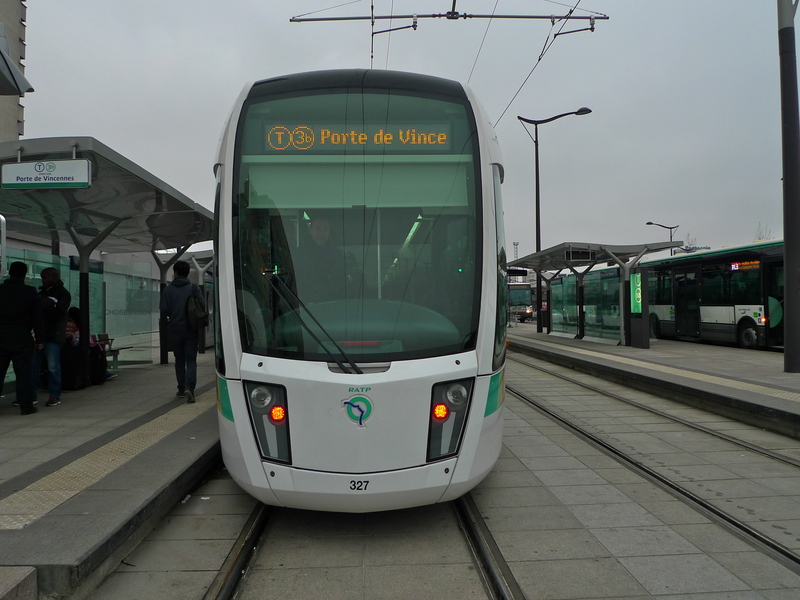 The trams are the Citadis 402 model built in France by Alstom. They have a low-floor ensuring easy access for people with reduced mobility and they are equipped with air-conditioning and CCTV. Each tram comprises seven modules with a total capacity of 304 people. Six asynchronous motors with a rated output of 120 kilowatts drive each tram and the 750 volts of power required is supplied by overhead pantograph. The trams travel at up to 20km/h (although they can theoretically travel much faster) and they take priority at all road junctions. They are extremely quiet thanks, in part, to the tramway being grassed over for a good part of the route. 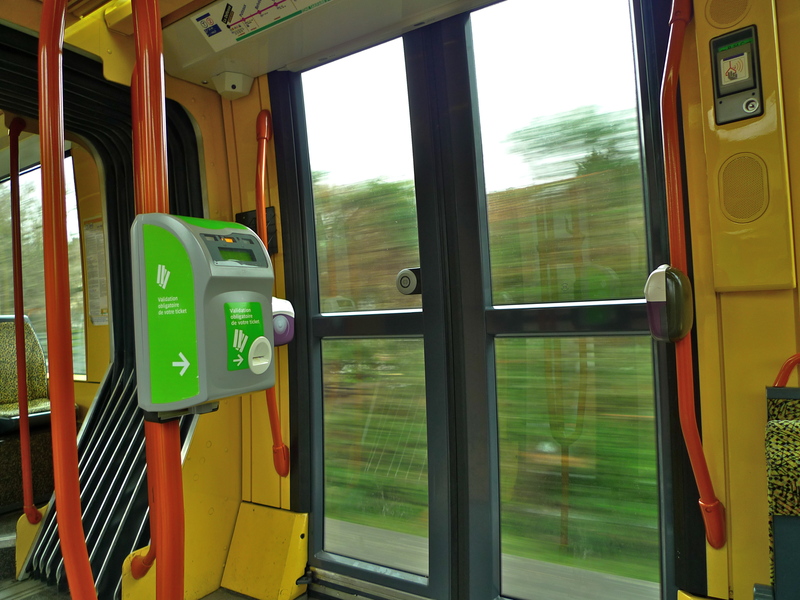 This helps to reduce vibration and noise to both those inside and outside the tram. Incidentally, to save water the grass is watered automatically at a variable rate depending on the weather. The trams run every four to five minutes during peak hours and six to eight minutes off-peak, Monday to Friday. On Saturday, the interval between trams varies from six to nine minutes during the day and seven to ten minutes on Sundays and holidays. 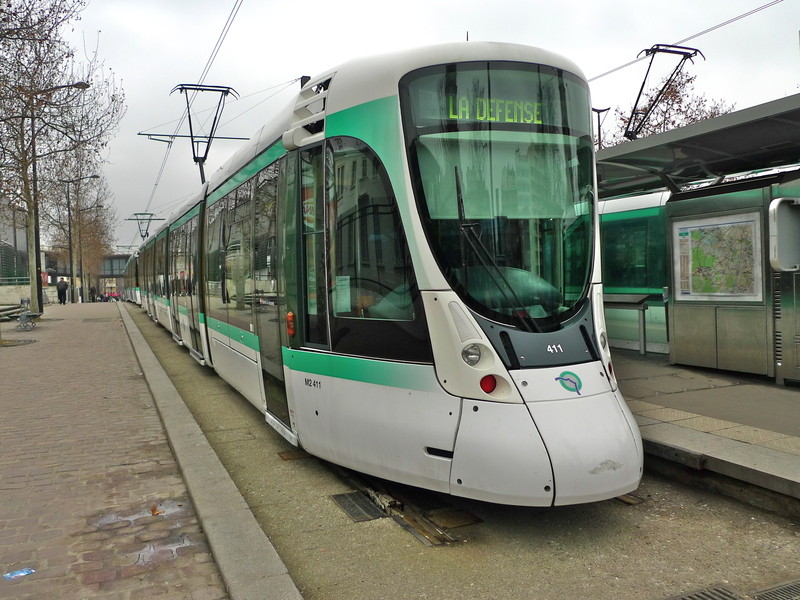 For a long time I’ve taken a great interest in the sounds of the Paris mass transit system and so I was especially excited to hear that new, very innovative, tram announcements are being incorporated on Tram Line 3 to coincide with the extension of the line. The City of Paris and RATP (the Paris mass transit authority) have commissioned selected contemporary artists to create special artworks along the route of Tram Line 3. One of the artists, Rodolphe Burger, former leader of the French rock band Kat Onoma, and head of La Compagnie Rodolphe Burger, was asked to come up with an innovative way of announcing the names of the tram stops. 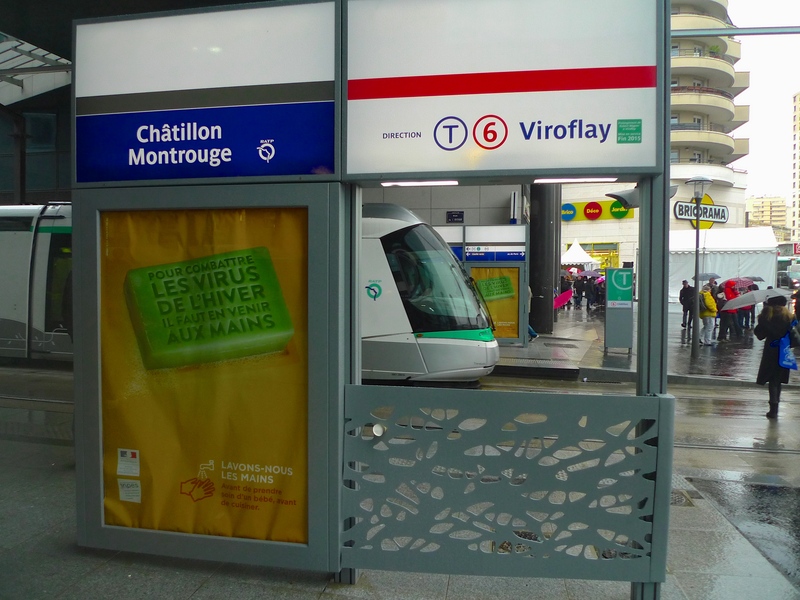 RATP stipulated that it was important that each announcement should have two inflexions and that the sounds should be heard but not be intrusive. 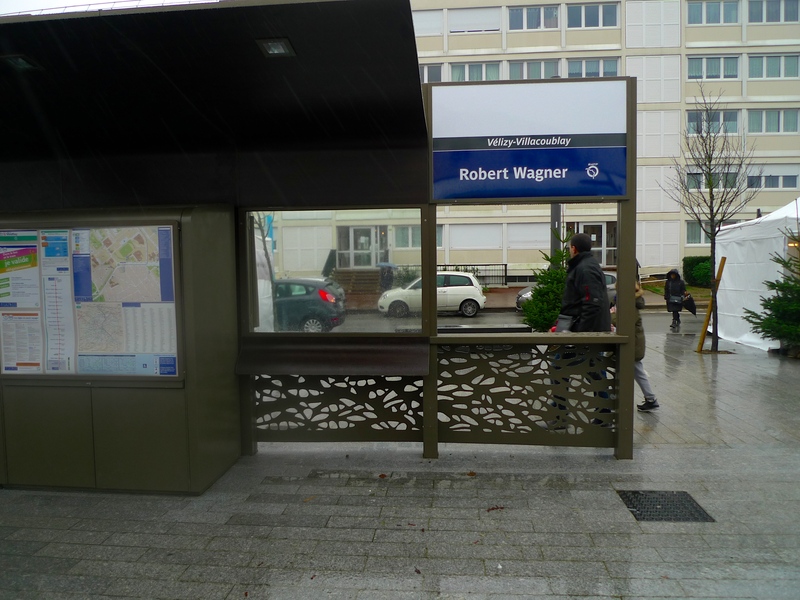 The work took two years to complete and Rodolphe Burger and his team have now come up with 42 different short melodies for each of the 42 tram stops on Tram Line 3 and each of the tram stop names are announced by different voices. The idea was to mix different type of voices, male and female, from any age, any background, any accent, including the occasional celebrity! A call for volunteers met with a large response especially among people living near the line. In total, 602 different voices were recorded. 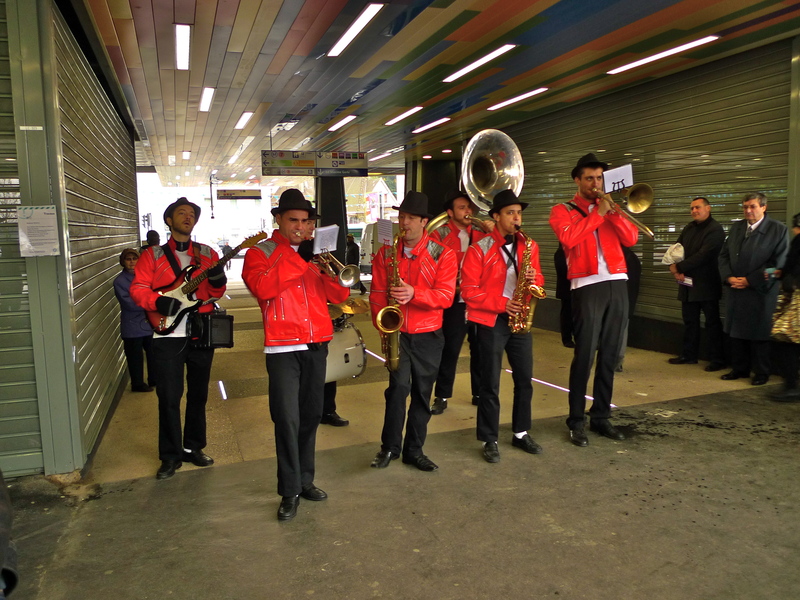 So when you travel on Tram Line 3, you never know which voices you will actually hear, only the melodies remain the same. Thanks to RATP, I am able to share with you some examples of the sounds that Rodolphe Burger and his team created in their original form – before they made their way onto the trams. Colette Besson; French athlete and winner of the 400 m at the 1968 Summer Olympics in Mexico City. In order to give you a snapshot of what the new announcements sound like from inside a busy tram, I’ve extracted these seven tram stop names from my journey for you to listen to. And, if you would like a more immersive experience, why not join me for the whole journey from Porte de Vincennes to Porte de la Chapelle. The journey takes thirty-five minutes and you can hear all eighteen tram stop announcements in real time just as I and all the other passengers heard them. With grateful thanks to Song Phanakem, the man responsible for the sound identity of RATP, whose help is always invaluable and much appreciated. 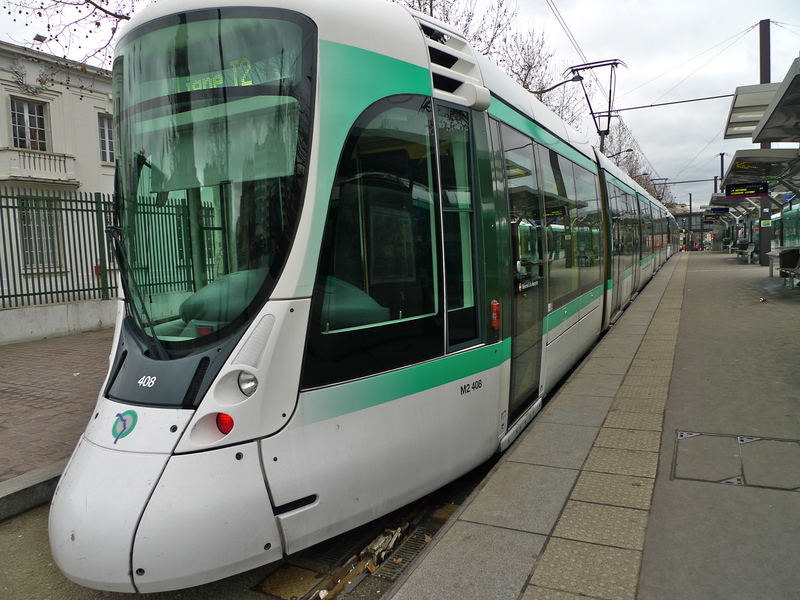 TODAY, THE TRAMS IN PARIS are modern, sleek and efficient but their history goes back to the middle of the nineteenth-century, predating the Paris Metro by almost fifty years. 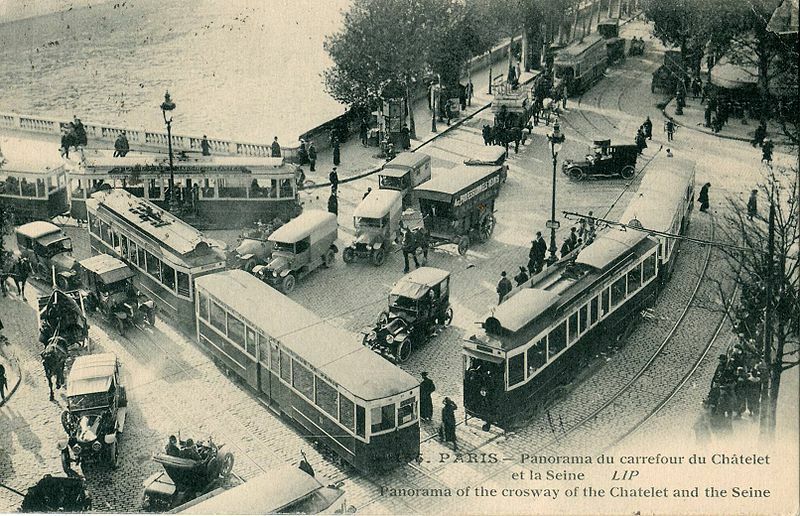 From 1855 until the end of the 1930’s, Paris enjoyed an extensive tramway network. 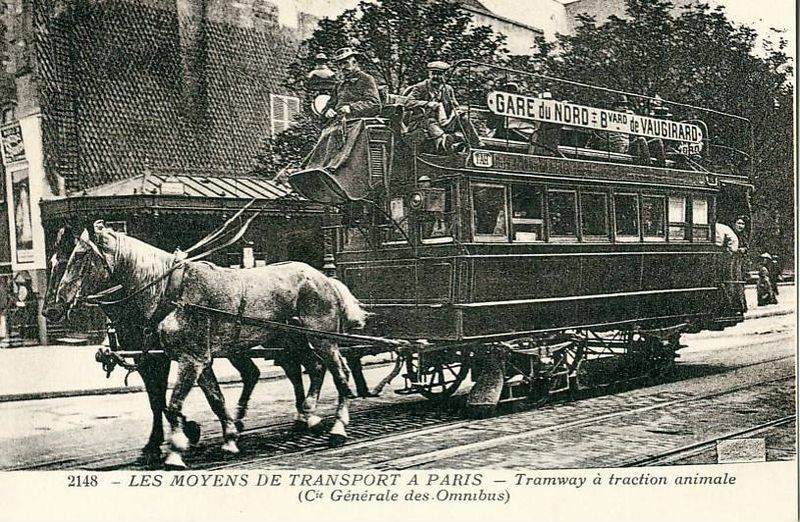 In the early days the trams were horse powered. Horse trams though presented a number of challenges. They were relatively slow and several teams of horses were required for each tram each day – not to mention the tons of horse manure littering the streets. Mechanical traction was the answer. 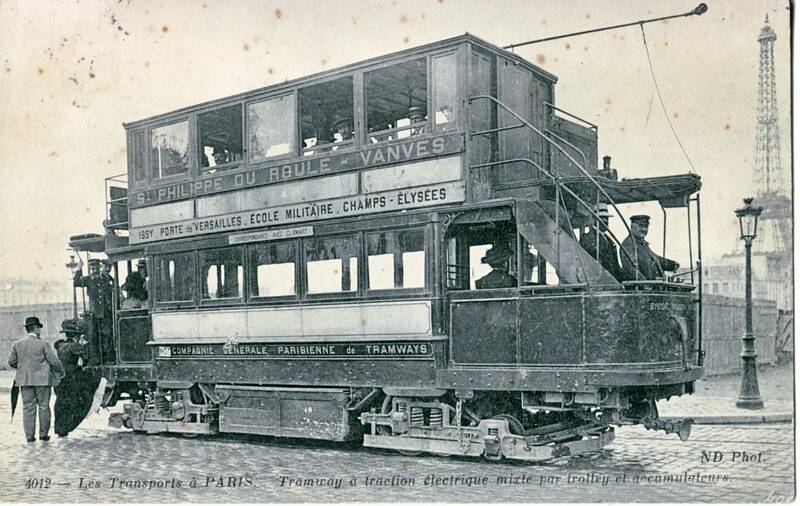 By 1887, trams powered by compressed air had arrived in Paris. Steam driven trams were introduced in the 1880’s and 1890’s but, by the end of the nineteenth-century, electrification of the trams was underway. 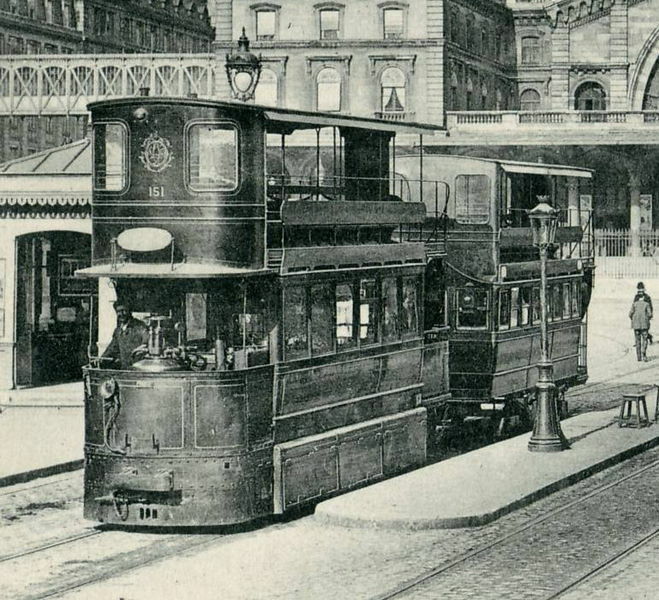 In the late nineteenth and early twentieth centuries trams were prolific in Paris but the advent of the motorcar and motorised buses, without the need for costly infrastructure, marked the beginning of the end for the tram. The last of the tram routes in Paris closed in 1957. But that is not the end of the story. 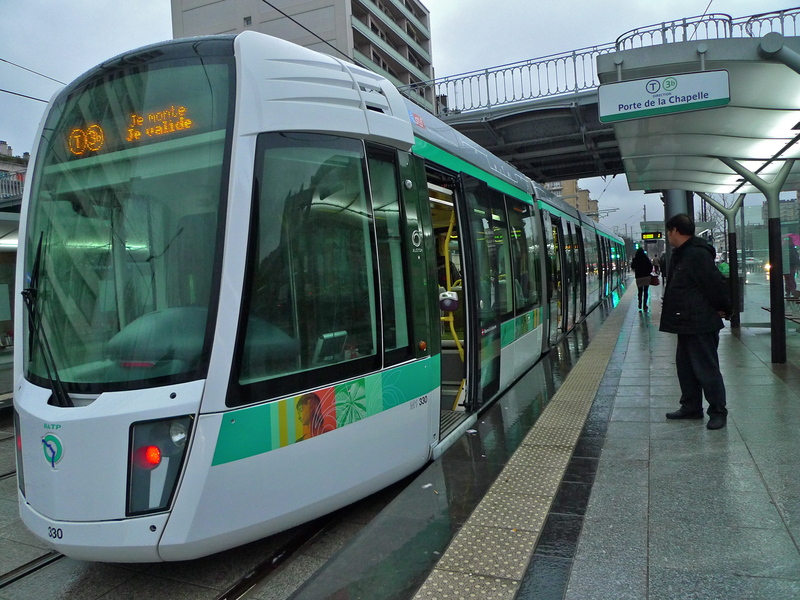 The increasing need to connect Paris with its suburbs has led to the re-birth of the Paris tram. 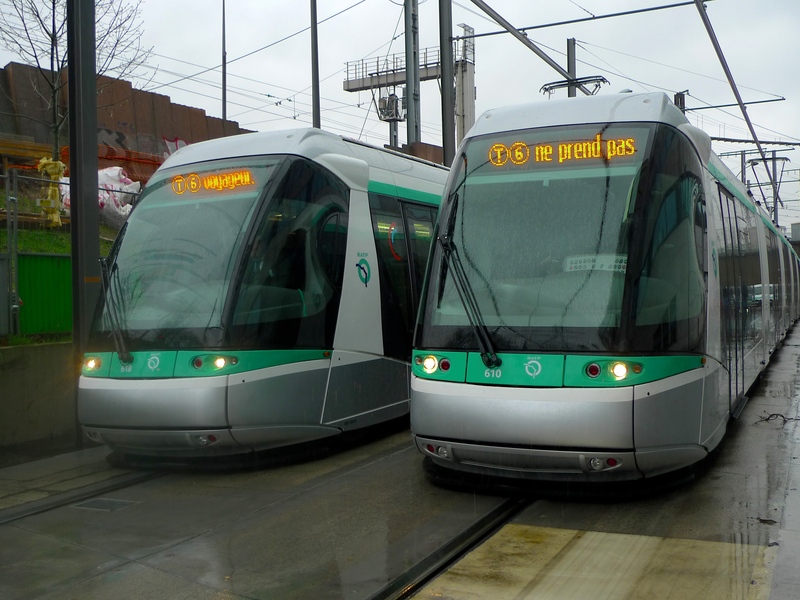 Equipped with a new generation of trams, Paris now has four tram lines with more due to be built. Line T1 opened in 1992, line T2 in 1997 and lines T3 and T4 opened in 2006. Of these tram lines the one that I’m most familiar with is Line T2 which runs south from La Défense to Porte de Versailles. Operated by RATP, the Paris mass transit authority, Line T2 is 13.7 km long, has seventeen stations and is used by some 20 million people a year. Each tram can carry 440 people. As with the Paris Metro, the names of the stations evoke images from French history. Stopping at stations like Jaques-Henri Lartigue (French photographer and painter), Henri Farman (French aviator and aircraft designer) and Suzanne Lenglen (French tennis player and winner of 31 Championship titles between 1914 and 1926) seem to add colour to the journey. 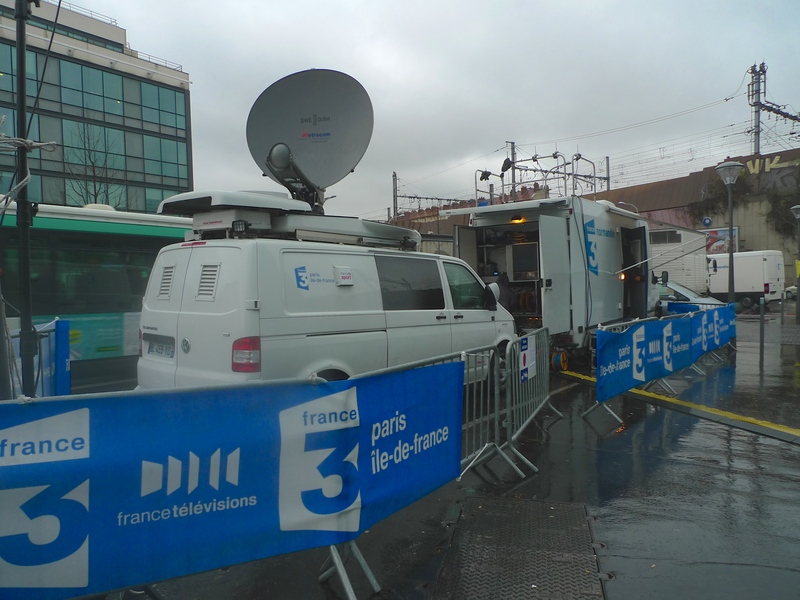 And again, like the Metro, RATP have taken trouble with the sound of the announcements inside the tram. Each station name is announced twice and at the terminus the announcements appear in several languages each spoken by native speakers. 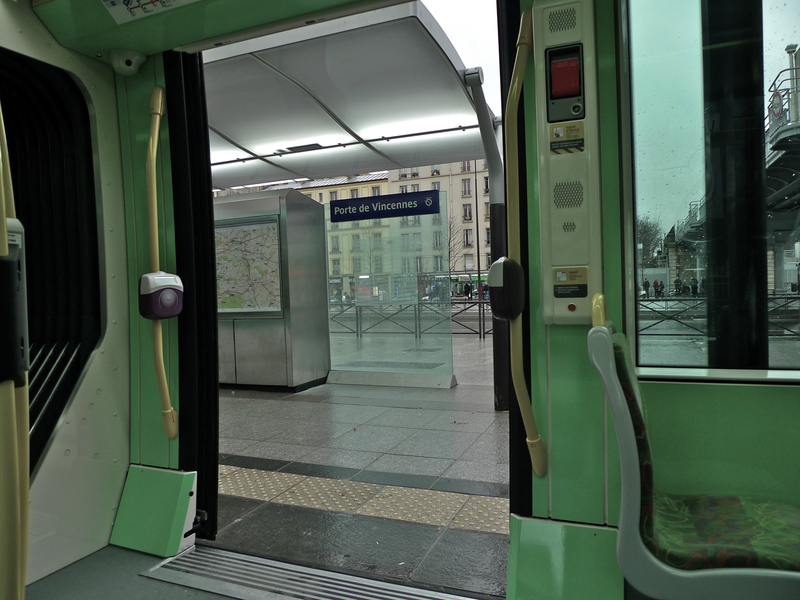 Today’s Paris trams are remarkably quiet both when listening inside and from the outside. In fact, from the outside, it’s much easier to hear the sound of the traffic than it is to hear the sound of the tram. 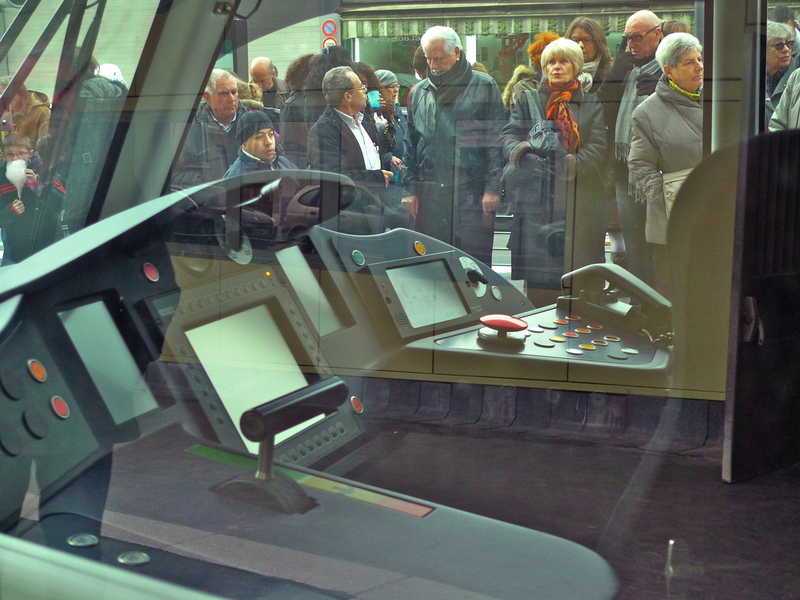 The new generation of Paris trams are far removed from their nineteenth-century ancestors. 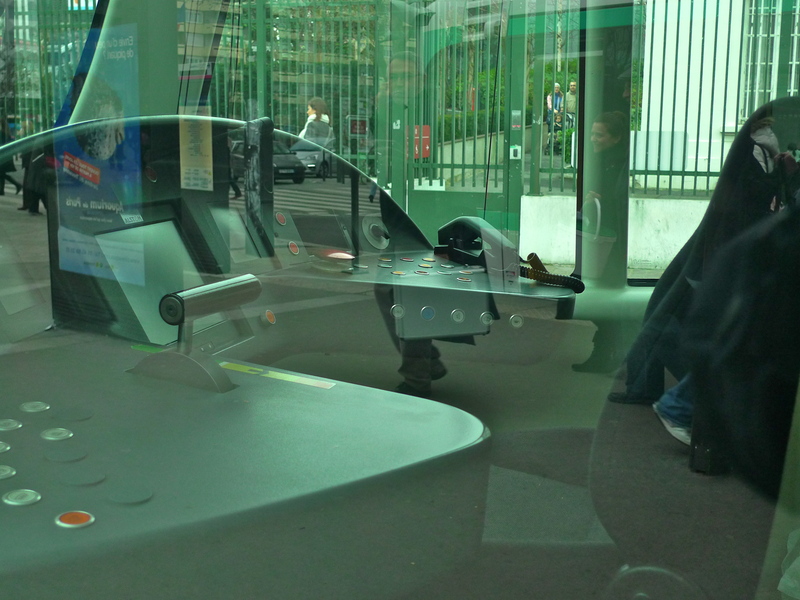 Quiet, sleek, efficient and comfortable they are an integral part of the Paris public transport network.